It only seems like yesterday, driving round a windy Bruntingthorpe, car to car explaining over taking and positioning to Callum as he listened intently, sponging all the information he could before his first race and now I’m congratulating him on a near top ten finish in one of the UK’s most competitive race series, his development has been remarkable. At yet as the penultimate race at Brands Hatch it could’ve been so different. At Brands we had our worst weekend thus far, in the second Toyo Saloons race Callum got caught up in a start lane incident resulting in hitting the car in front on the grid then getting hit from behind, the damage was severe enough for us to have to withdraw from the Production BMW races and consider the car written off. The front end was so badly damaged the radiator was bent over the engine and the rear impact had bent and twisted the chassis leg, at the time I pretty much thought the season was over. Back at the workshop we got a better look and despite it financially being a questionable decision the decision was made to repair the car and have it ready for the last race. It wasnt that the car wasnt repairable, it was more that the cost to repair was financailly hard to justify, in road car terms this was a Cat D car if ever there was one. However sometimes race cars get under your skin and as much as your head says no your heart says yes and Callum was keen to repair rather than replace so we got to work – the whole fornt and rear end was removed and the car placed on a jig where we pulled out the rear leg and strightened the front. 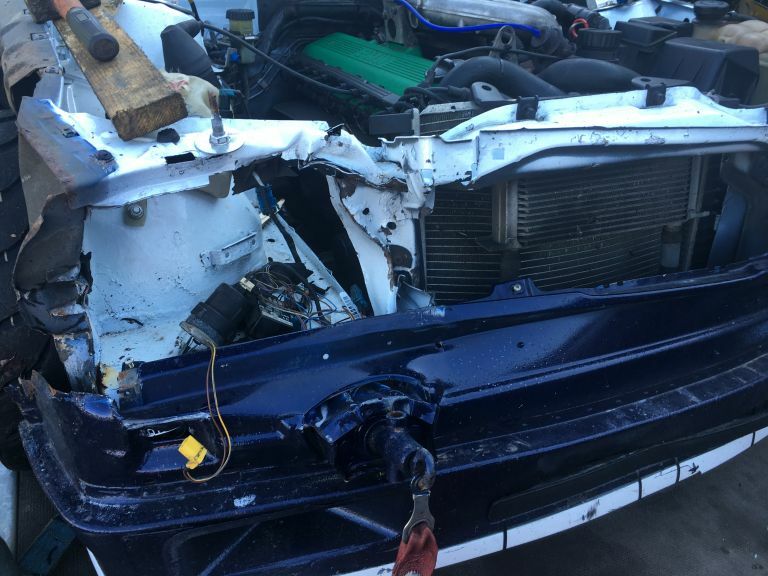 The wings, bonnet, rear quarter, both bumpers and lights were replaced – we ended up wiping out two cars spares package in one go. In short most of the cars exterior was stripped, replaced and painted. Considering it took 5 days to make a decision and get the car to the paintshop we managed to do 2 weeks of work in 4 days. 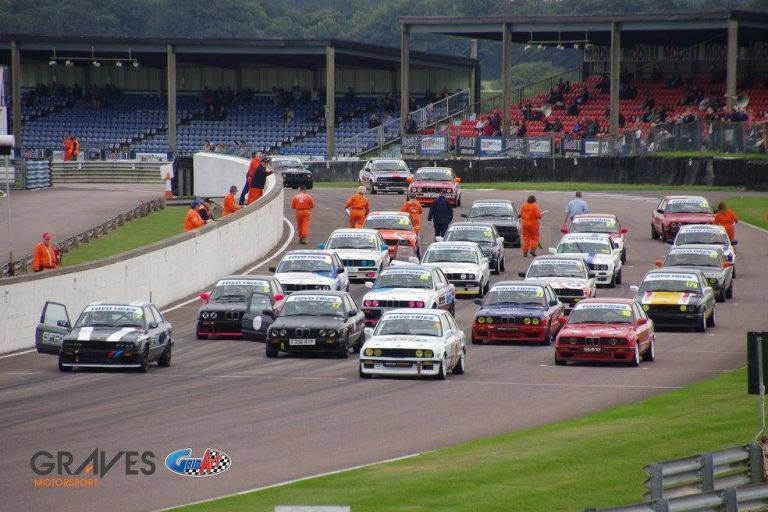 With a rebuilt car and the last race at Thruxton (a circuit Callum had not even visited, let alone tested at) our plan was simple – first runs just make sure the car is ok, after that learn what you can and enjoy the last races of the season. 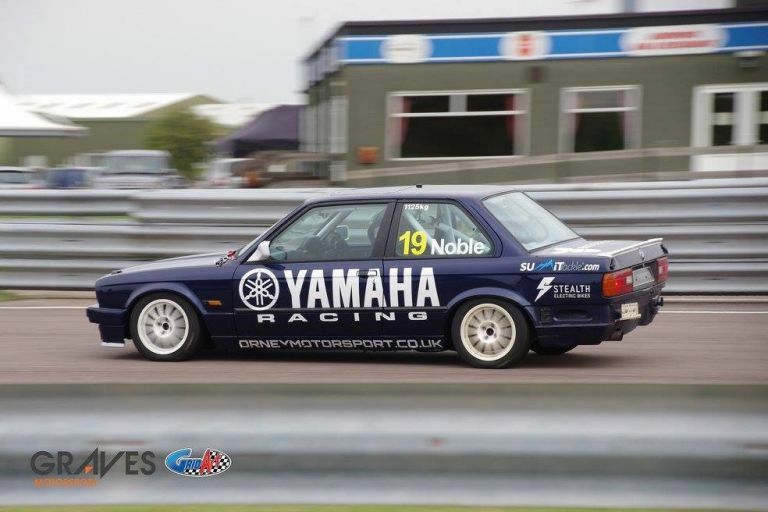 If Brands was a low then Thruxton was a high, the car was perfect, no issues at all and drove as if it had never been gang raped the week before and Callum impressivey did the same. A start lane shunt can be quite frightening, you can usually see a crash mid race coming, the car loses control and you have (what seems like ages) to prepare yourself for the impact but grid crashes are sudden ‘wtf happened then?” affairs for the driver and its sometimes hard to get back from that – not an issue for Callum, no hang ups just stright back out there ready to go, well done. For race one Callum qualified 17th out of 25 so not great but not bad and in the race he got up to 15th which we were delighted with but twice in the race he was rammed from behind by another car, the same car in fact that smashed him out of race 1 at Donington Park earlier in the year so after all the work we’d done repairing it we werent happy. 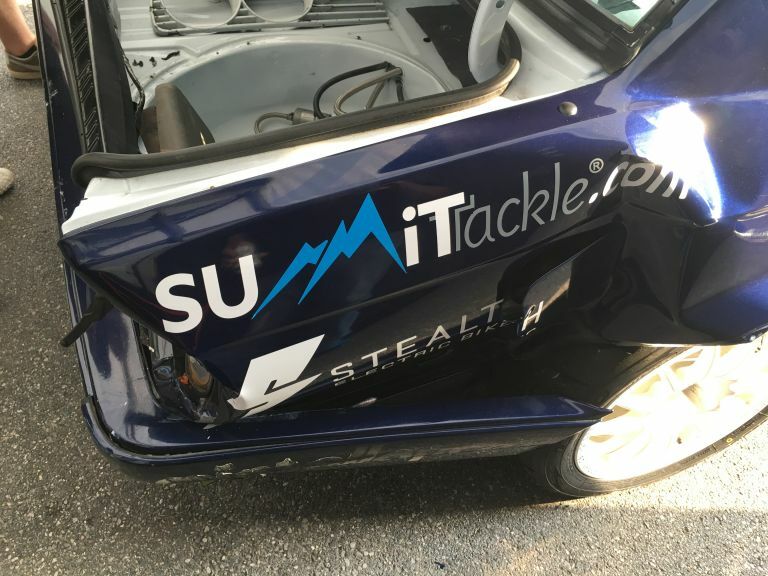 The damage was light but in the exact same spot we’d repaired and in part was down to a broken rear brake pad that meant the rear wheels would lock under hard braking, however theres no excuse for ramming someone from behind just because he got out of shape. Brake pads replaced we got sorted for race 2. The car was dented but sound and my last word to Callum were just ‘enjoy it mate’. And he did. A lovely race, no issues and 2 seconds off his best laptime for the day, we ended the season on a high. As an additional bit of fun there was a ‘handicap’ race at the end, you couldnt really take it seriously as the handicap method was a little eclectic and in 20 years of racing I’ve never seen the whole grid start from the pitlane before but it was fun to watch and Callum came home in 7th place in another nice drive with quicker laptimes. As for the season? Well, Callum coming in 12th place overall is an impressive one. Its only his second season racing ever and in pretty much every race he has finished higher than he’s qualified – thats a racer. In every weekend his laptimes have improved from the Friday to the Sunday and he’s never been sanctioned for avoidable contact – he’s quick and he’s clean. The Production BMW Championship remains as the best series in the UK for a driver to both learn and also compete and what I feel is a pretty high level and as a result I’m delighted Callum has decided to carry on with the Championship with us for 2017. As well as being grateful to Callum for his actions and company this year I’d also like to thank his family for always being a laugh at race weekends and his merry band of mates who every week teach a new slang word which I then share with my 13 year son so I remain ‘with it’. Thanks to Graves for the picutres and John and the team for the organisation. I’d like to thank our team partners, D&B Coachworks in Mosley, yes its a long way to go to get paintwork done but these guys are retained by Mclaren for their racing so we are in good hands – they have never failed to get the car done on time and in budget. Toyo tyres for their consistent R888R tyres, to Yamaha for their vehicle support, to Team Dynamics for wheels that dont break and Performance Friction for their parts that do. Most importantly I’d like to thank our team, the two Toms, Cory, Keith and Josh, a more talented and loyal bunch I cant imagine, thank you guys. 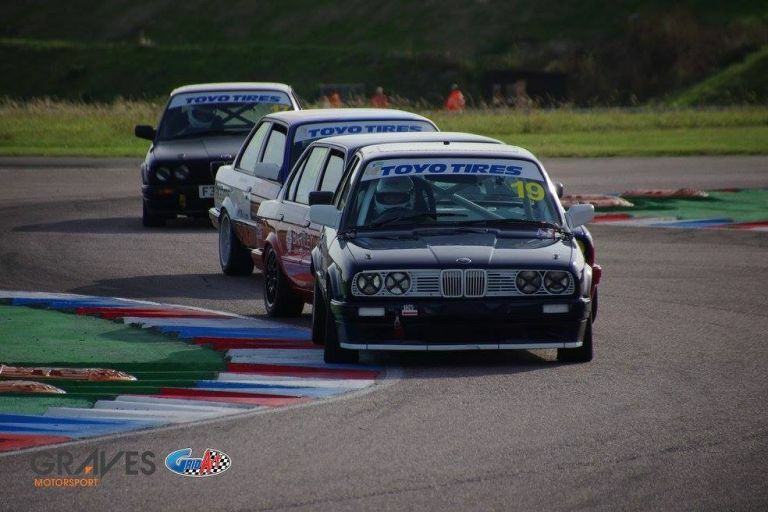 Next season we hope to have two PBMW cars and our own Astra GTC VXR-R out in Toyo Sallons, which if I cant find a driver like Callum I’ll even race myself again – hows that for a threat.